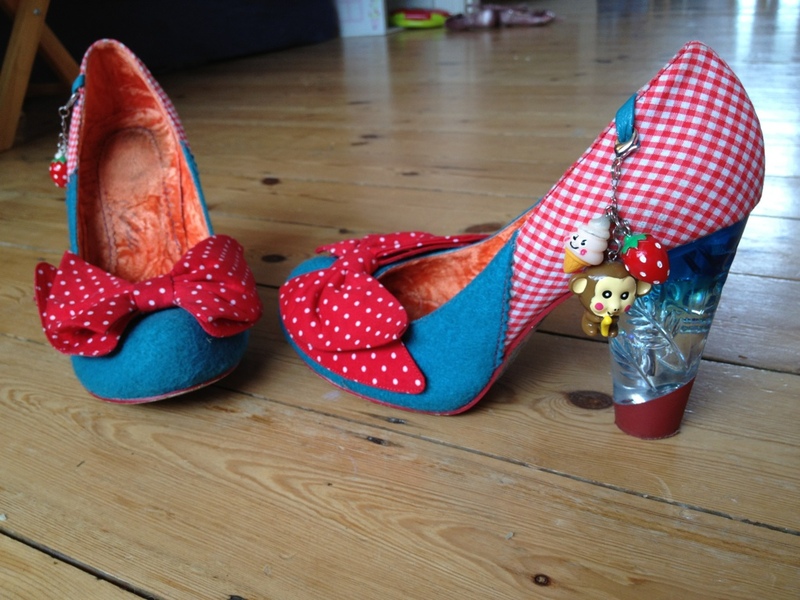 Wednesday’s school-run shoes are some of my favourites: a pair of Irregular Choice ‘Trinkletina’ turquoise felt heels splashed with red gingham bows and backs, they also incorporate three smiling ice-cream, strawberry and banana-hugging monkey trinkets on each shoe (of course)! The heels have thick red rubber tips, topped by graded transparent plastic, going from clear to turquoise again, embossed with plastic ferns. Yes, they’re totally bonkers – “Curiouser and curiouser”cried Alice! – and that is exactly why I like them. To me, fashion is all about fun. Life is serious enough as it is, without having to dress in funereal black all the time. I’m far more of the vibrant, theatrical Anna Dello Russo attitude than the joyless, passion-chilling, cheer-leeching Anna Wintour ‘Nuclear Winter’ mode. For me, it’s all about having a sense of humour – which I think you can probably tell from my colourful shoe and clothing collections, and my light-hearted approach to fashion in general!